The cake is massive! It actually require 450g apiece of sugar, butter, and flour, plus a whopping eight eggs! Once again, I misjudged my little bundt tin, and the cake was far too large. I felt it would be, and prepared a loaf tin for the excess, however still managed to overfill the bundt, and then felt it more appropriate to make 4 cupcakes with the remaining batter. Note to self: the bundt tin should only be 2/3 full! I used chocolate frosting (recipe from the same book), however this made far too much icing. Only half is needed. The butter wouldn't incorporate properly with the sugar, so in a desperate bid to save it, I zapped it in the microwave for 30 seconds. This made it more pliable, however I still was not happy with its consistency so I added around 15g of goats' cheese, which didn't affect the taste, but did get it closer to the desired creaminess. The topping was meant to be finished with chocolate shavings and coffee beans - like I would bother! No; instead I sprinkled liberally with multi-coloured chocolate drops (white, milk, and dark)...before the cake had cooled properly. So they melted. I have renamed the cake 'Erupting Chocolate Coffee Cake', and put it down to artistic licence. The centre of the cake did not bake properly, so I returned it to the oven sans tin (after its recommended 40-minute bake) for around 20 mins @ 150 deg C with foil around the outer edge and top. This helped it somewhat, but not entirely. I am hoping the icing can disguise any mishaps, however I am not convinced by my own hope! 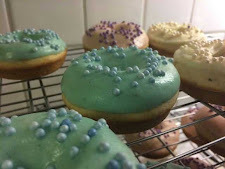 The cupcakes are delicious, though, so the flavour is right, I just need to get the recommended 25cm ring tin. Ironically I saw it in the shop today, and decided not to buy it as I intended to bake bread tonight rather than cake. Update: the centre was still a bit squidgy looking, and I put it down to using the bundt tin, so the entire quantity of the cake did not have an opportunity to bake properly. Edible, but I wasn't happy. Dalek on a night out?! 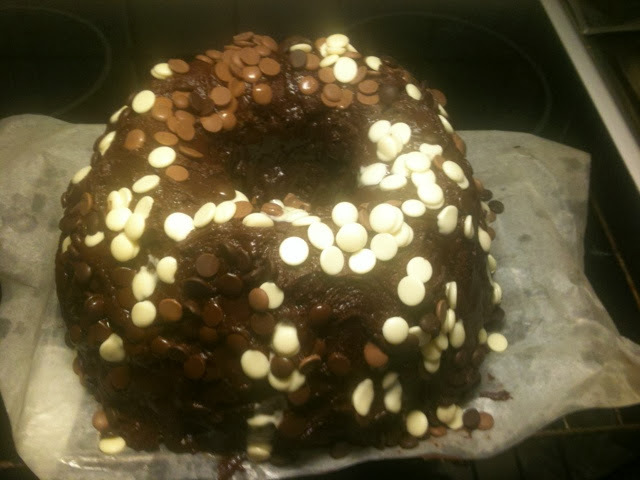 I'm reading this while I am updating my blog, and I am aware that I have written about this at a later point, however I am unsure whether I also mentioned that this cake is intended to be baked in a ring pan rather than a Bundt one! Well that's the case, and explains some of the issues I had with my initial attempt.